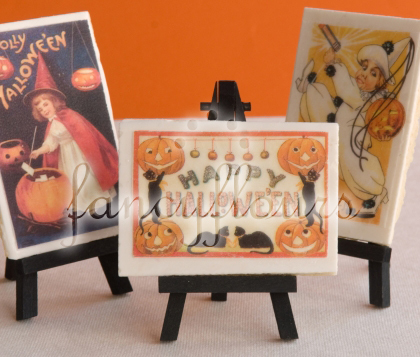 Back and better than ever…our new line of Wafer Paper takes on a new spin with these Vintage Halloween Postcard designs. Wafer paper is simple to use and gives incredible results! Depending on the design, wafer paper comes in full sheets that you cut down to match your cookie shape. Bake and cool cookies as usual. Ice with royal icing (available at fancyflours.com) or other icing that will dry smooth and firm. Carefully cut out wafer paper shapes (using the same cookie cutter you used on your cookie dough to trace will ensure accurate shapes) using craft scissors. Wafer paper is fragile! Using edible clear gel (available at fancyflours.com) as a “glue.” Use your finger to apply a small layer of gel to the back of the wafer paper. Adhere to hardened icing. Flip cookies up-side down onto wax paper to dry, for about 30 minutes. This will help the wafer paper dry flat. Flip over and voila, a cookie masterpiece! Halloween, Thanksgiving and Holiday designs are now available at fancyflours.com. This entry was posted in Halloween Baking, Instructions & How-To's by Fancy Flours. Bookmark the permalink. I love the vintage look. They are quaint, with their innocent by-gone approach to Halloween. I just received your catalog and have been drooling over all your products. They are new, exciting and very creative. Keep up the good work. I love the vintage cookie concept.What I would really like is for smaller designs for halloween and Christmas.One large cookie for a small child is just too much cookie.Otherwise they are perfect,and I wish someday to visit your store! I would love to try these but the adhering the wafer transfer to the cookie with corn syrup sounds tricky! Has anyone had any experience with this and can offer any other tips than what’s in the catalog? (Which were very helpful, by the way) I also think some smaller versions would be great! Thank you for your comment on the Fancy Flours Blog. It is really not too tricky at all! Just simply cut out the wafer paper shapes with small craft scissors. Be careful not to break wafer paper as you are cutting it. Then spread a thin layer of corn syrup on the back of each shape with a pastry brush – or you can use your finger. Then carefully flip the shape onto the top of your iced cookies. In order to get the wafer paper to dry flat on the cookie – flip cookie right-side down onto a piece of wax paper for 30 minutes so that the wafer paper dries flat. Then flip the cookie right side up to finish drying. I hope this information helps. If you have other questions please email us at: info@fancyflours.com.